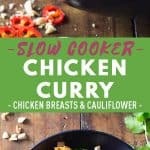 Slow Cooker Chicken Curry is a flavourful Thai chicken dinner recipe, made easily in a crockpot! A flavorful meal with juicy chicken in thick red curry gravy. It’s delicious with rice or a piece of Thai roti. It requires very little prep work, it freezes well, and is naturally gluten-free! What does chicken curry taste like? 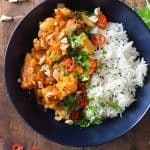 Most Thai curries, including this slow cooker chicken curry, have a balance of savory and spicy flavours. Spices like ginger, red chili, lemongrass, and galangal give the dish an earthy flavour. Some people prefer to buy the Thai curry paste, while others make their own. Um, I’m lazy, I buy it, haha. The sauce for this chicken curry is a combination of coconut milk, curry paste, onion, garlic, and ginger. Basically, this crock pot chicken curry will take your taste buds for a flavourful ride! What’s the difference between red and yellow curry? There are 3 different Thai curries: red, yellow and green. The spices are similar in all three Thai curries; the main difference is the type and amount of chili peppers used. The chilis change the flavor of the past and also the degree of spiciness. Which of the Thai curries is spiciest? Yellow Thai curry is the least spicy and green Thai curry is the spiciest. So this recipe is an in-between by using red Thai curry paste. If you are cooking for children I recommend you use yellow curry paste instead of red and if you want to divide a batch for kids and one for adults you can use yellow for the whole batch and then add bird’s eye red chili chopped up and sprinkled on top of the adult’s plate. YUMMY! Curries, like this slow cooker chicken curry, freeze very well. If you don’t reduce the broth it won’t freeze as well because coconut milk tends to separate when thawed. If you do reduce it though, most of the coconut water evaporates and you are left with the delicious coconut cream which holds its shape fantastic in the freezer and when thawed. Before freezing crock pot chicken curry, be sure it is completely cool first. Once it is cool, place it into freezable containers or large silicone freezer bags. Be sure to leave some room at the top of the bag or container for expansion. 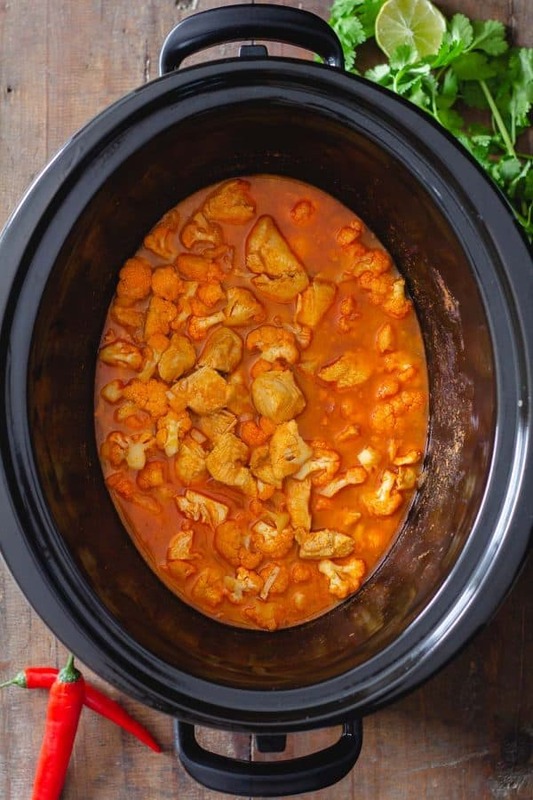 When properly frozen, the slow cooker chicken curry can stay in the freezer for 2 to 3 months. If you won’t be freezing the chicken curry, it will stay good in a refrigerator for 3 to 4 days. To keep the chicken curry recipe controlled in the fat-department, we use boneless, skinless chicken breasts. The coconut milk is already offering plenty of healthy fats. Some people prefer to use skinless chicken thighs in slow cooker recipes. Either of them will work just fine with this recipe. You all know I love to add plenty of vegetables to just about any dish. 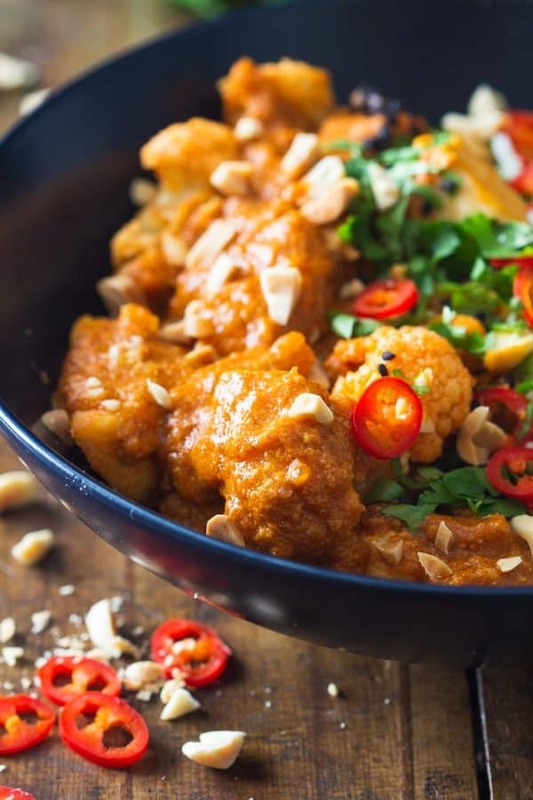 My favorite for this curry is cauliflower! If you like your cauliflower super soft, add it at the beginning with the chicken. If you like it crunchier (like I do) add it later in the slow-cooking process. Even if you don’t have a slow-cooker you can still make this recipe on the stove-top. 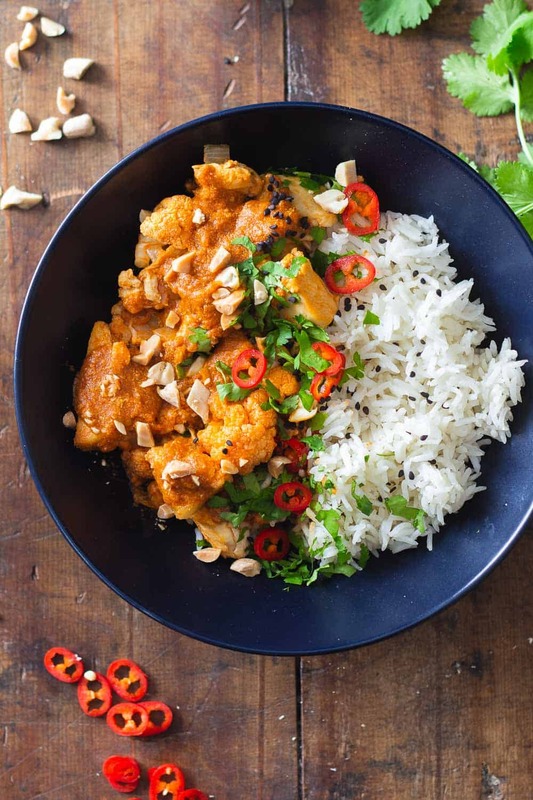 I have instructions here in my Thai Chicken Cauliflower Curry post. Peel and finely chop onion, peel and crush garlic, and peel and grate ginger and set aside. Add curry paste and coconut milk to a bowl and whisk until well combined. Pour curry coconut mixture into the slow cooker, add onions, garlic, and ginger and give it a quick stir. Cut chicken breasts into large cubes and add to the slow cooker. If you like your cauliflower very soft, add that, too. Give everything a good stir, place the lid on the crock pot and set it to 3-4 hours on low. (I don't recommend high and I don't recommend longer than 4 hours, there is little liquid and it might burn). If you like your cauliflower crunchy, add about 1.5-1 hour before the cooking time is over and stir, then place the lid back on. Once the cooking time is over, remove the chicken and cauliflower with a slotted spoon and transfer the sauce into a pan and bring to a boil for 2-4 minutes so the sauce reduces and becomes super creamy. Stir often during the reducing process. Serve chicken and cauliflower over rice, pour the creamy sauce over everything and sprinkle with chopped peanuts, sliced red chili, chopped cilantro, and sesame seeds, then drizzle fresh lime juice over everything and enjoy!